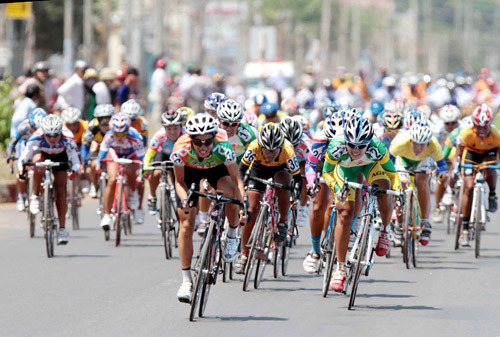 HA NOI (VNS) — The International Womens Cycling Tournament, the Binh Duong Open, will kick off on March 7 with the participation of 11 local and foreign teams. Seventy cyclists will compete in a race of nearly 700 kilometres over eight stages. In its fourth edition, the tournament organisers have invited strong rivals, Thailand, Japan and Malaysia, to participate in the event. The organisers said the foreign competitors will have to vie for the Cup with Viet Nams strongest squads from Binh Duong Water Supply and Drainage, An Giang Plant Protection and Domesco Pharmacy Dong Thap. "This year the length of the race is longer and the cyclists will pass through mountainous and hilly terrain. These would be big obstacles for everyone," said Ngo Van Lui, deputy head of the organising board. The 105-km long first stage will be from Binh Duong City to Xuan Loc District of Dong Nai Province.